Dad of Three Amazing Kiddos....Blessed beyond Blessed! It’s hard to believe that 2017 is coming to an end and we’ll be ringing in a new year in just a couple of days! Come midnight on Sunday, we’ll be looking back on the memories of 2017 and toasting to all that we look forward to and all that is to come in 2018. For Christmas, my children gave me this metal print to hang in my apartment. 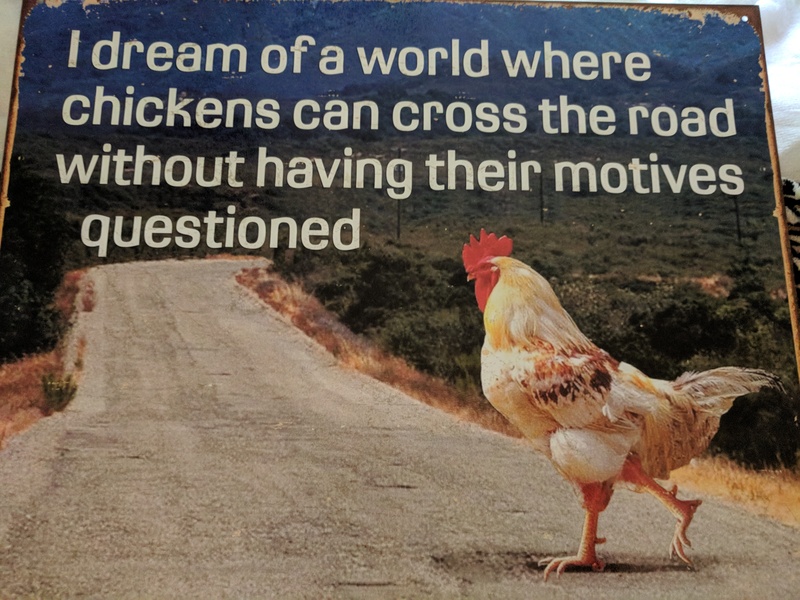 It says, “I dream of a world where chickens can cross the road without having their motives questioned.” Funny, huh? How many times have you asked, “why did the chicken cross the road?” I feel like my children thought it was a hilarious print that would make people laugh, or be a great conversation piece. Well, I found the print quite inspiring and something I’ll talk about later. Recently, Merriam Webster published its top 10 words for 2017 that include words like feminism, complicit, recuse, dotard, gaffe, and federalism. Events occurred during the year that caused increases in searches, across the country, for these words and made them more popular than others. Feminism was the word of the year, according to Merriam Webster. Before we close out 2017, and all that it was, like Merriam Webster, I want to share some words that were meaningful to me this past year, words like blessed, relationships, work, triathlon, health, training, and motivation. Many special times, events and challenges throughout 2017 have caused those words to stick out more to me than others this year. I will forever be grateful for the blessings in my life. I know I’m a blessed man and I wake up each day thankful for my children, those who love me, my health, and my work. There have been times when I have taken some blessings for granted. When things are going well, sometimes that’s easy to do. I strive every day to thank God and appreciate the blessings I have been given. 2017 was a year full of many blessings for me, blessings that I will always cherish. I am thankful for my relationship with God and all He has given me, including the relationships and people He has put in my life, especially my children. I am grateful for the people who love me, encourage me, support me and who I know are always there for me. Relationships are so important and without the relationships I have in my life, 2017 would have been a much different year. I started my current job on January 3, 2017 and can say, without a doubt, that it is the best job I have ever had. 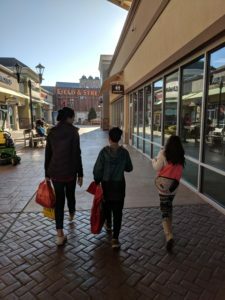 The work that I do is very fulfilling and provides me and my children the opportunity to do fun things and enjoy exciting adventures together. There has not been one day where I have dreaded my day on the job. My first year there has gone by fast, with tough learning curves and many challenges, but I am so grateful for the job that I have and I love it. I am employed by a great organization and work with some amazing people. These three words go together and were a big part of 2017 for me. 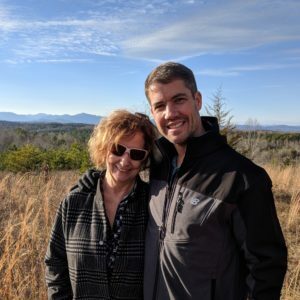 I started focusing on my health back in February and have found an addiction and a love for fitness, eating healthier and training for triathlons. I lost over 40 pounds this year, competed in two awesome triathlons and feel as healthy as I have felt in my life, even at 40 years old. While my training regimen has been a little off during the holidays and I have not eaten as healthy as I like lately, I am so excited to get back on a normal workout schedule as I prepare for the half Ironman triathlon, in Raleigh, on June 3. In fact, I believe it’s a swim and a run day, today. Motivation, I believe, was my word of the year. It stood out and encompassed all those other words for me in 2017. As I look back on the past twelve months, the word motivation graced my vocabulary as much, or more, than any other word. Motivation occurs within a person when there is a reason for acting on something or a willingness to do something. It all starts with a motive, a “why.” I’ve always been motivated, but in 2017, I found a deep motivation within myself and from others to be an even better dad, to be the best man I could be, to remember my mistakes and learn from them, and to help others. I was motivated to inspire, to train hard, try new things, seek new challenges, be healthy, find adventure and to live in the moment. So, why did the chicken cross the road you may be asking? Was it just to get to the other side? We don’t really know why, but I bet there was something, or someone, on the other side of the road that motivated her enough for her to cross the road. I am grateful for 2017 and all that it was, but I am ready for a new year and I can’t wait to see what words are most meaningful in 2018. I have my goals written down, I know what I want, what I want to achieve and like the chicken, I am motivated to go get it. Why don’t you cross your road and go get what you want in 2018? I’m sure there’s someone or something that is motivating you. Go get it. If it’s something you really want or a goal you want to achieve, why not tri?